Pinterest is currently the world’s fastest growing social networking site and famous for the best functioning visual design. Do you love the look and feel of Pinterest? This post explains how to implement the same masonry dynamic layout with infinite scroll in ASP.NET. 1. Download and add jQuery Masonry plugin. It is a dynamic grid layout plugin which arranges elements vertically, positioning each element in the next open spot in the grid and minimizes vertical gaps between elements of varying height. 2. We are going to display product with description in each tile. Here is the structure of Product and ProductRepository class. In ProductRepository, GetData method takes pageIndex and pageSize parameters and generates dummy data and images of random heights. You can see the products are reordered to minimize vertical spacing. how can i write sql query in url??? 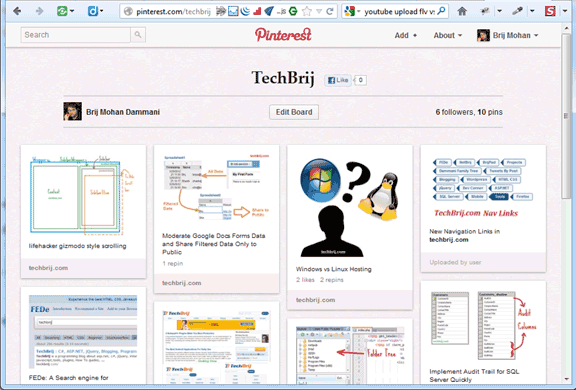 images are displayed row by row and not pinterest style…. HI , I am trying your code but do not work. Server side request sent when scrolling and success response is also got in loadMore() function. This statement $container.masonry(‘appended’, $newElems, true); does not append content in screen. And also images are displayed row by row not pinterest syle.